Any one do that ??? The main problem (as always) is locating a proper 10" LCD that will work with a standard video card. Actually, you'd need an 8.4" LCD. Usually there are a number of (mostly Hong Kong-based) sellers on eBay who have them. Is it high or moderate price? Very low price for me..!! It can watch TV and support VGA input 1024 X 768. !! The problem with older Colour Classic mods is that the hardware used to be very hard to find and very difficult to fit into the computer. I remember the Taco mod that someone on the old forums tried to do (Beige G3 and LCD in a CC), and it was incredibly hard because there were no mass-market 8.4" LCDs and controllers. These days it is trivial to glue or screw an 8.4" LCD made for cars into a compact Mac and then secure a Mac Mini and the power supply inside the case. It's a lot easier and cheaper now, but it just isn't the same. But Serang states he used a 10.4" LCD in his SE conversion. Does the SE have a larger, flatter front panel? or could some mods have been made to the SE that can be made to the CC? A 10" screen would be nice. Also on the 8.4" boards, what kind of video card is being used? Are they standard VGA input or DVI or what? Anything larger than an 8.4"
Anything larger than an 8.4" screen requires one to cut and enlarge the original screen opening in the Mac's case. As for input, the 8.4" unit I have - a Hami - uses VGA for input. I should also note that while images are quite nice at 1024x768, I find text very difficult to read at that resolution. And so when I use this monitor I usually run it at 800x600. That SE looks mighty nice with a 10.4" screen. I will have to look through the photos to see if he shows how much cutting he had to do to the front. That's a motherboard issue, not a space issue. Ain't no such slots on the Mini. The closest you could get would be using a MacBook Pro with a card slot (and maybe an adapter for full-size cards, but expect to pay $$). Still, apart from a second video card, there's not much you can't do with Firewire and USB these days. 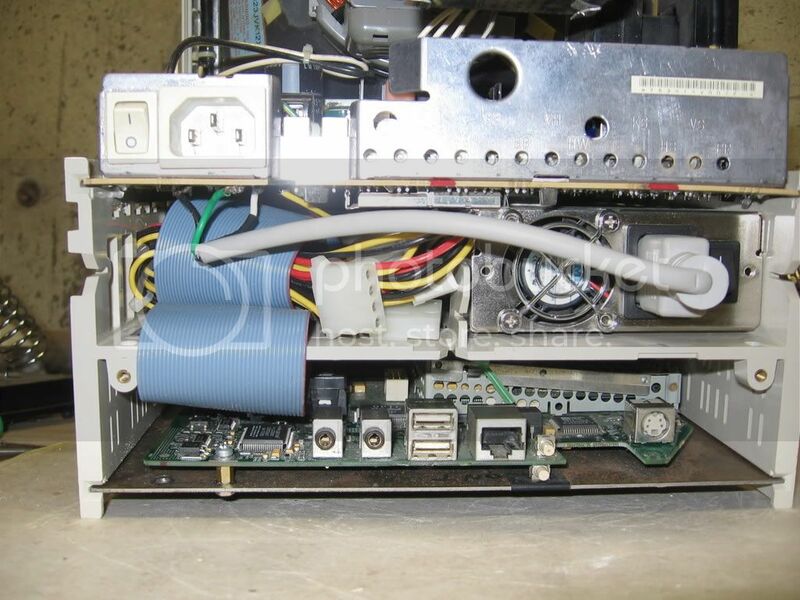 At least the Cube had an AGP slot, and the MiniITX boards often have a slot or two. The closest you could get would be using a MacBook Pro with a card slot (and maybe an adapter for full-size cards, but expect to pay $$). Still, apart from a second video card, there's not much you can't do with Firewire and USB these days. You're right, a Mini-ITX with OS X would be interesting, especially because VIA has stumbled upon the technology that makes their CPUs at least 5 times slower than you expect them to be. I've gotta get my CCs out of storage (or maybe just go there and 'visit' them) so I can be reminded of exactly what they look like in person. Seeing the photos it looks like the SE/30 (which I have never had) is a little more 'flat faced' compared to the CC's gracious curves to match it's Trinitron tube. Dear all, I put the Mac mini inside my color classic and fix it, now just to spray paint finally ....If I done I hope to share photo with us, Thank you!! May be two weeks ago or later...sorry!!!! I think english is not your native language so I hope you understand I am joking! It has all the pics of the making-of. It'd be very good to have the essential info in English one day. Btw, I'm native German. Yes I agree it was more challenging to fit everything in the CC frame in the past, especially since LCDs were not as readily available nor affordable. 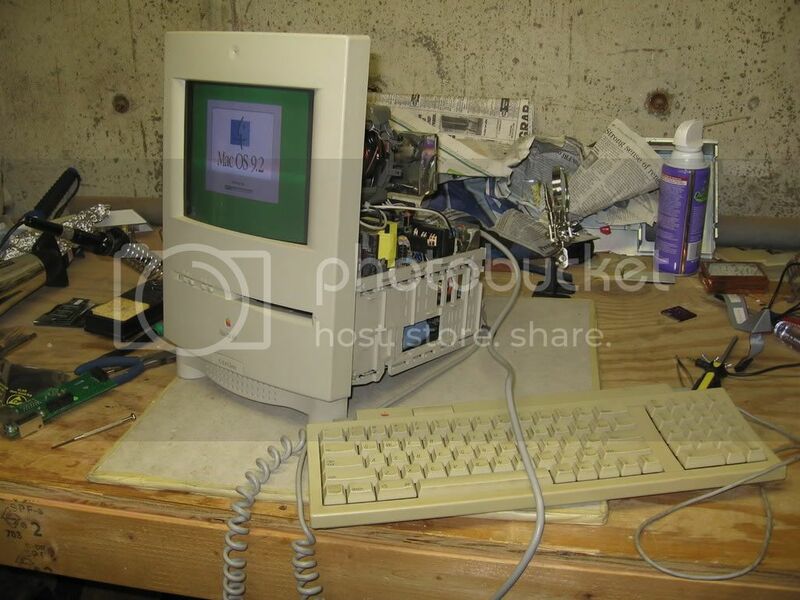 I ended up using an Imac rev A motherboard and reused the CRT by doing the VGA mod to get a 640x480 resolution. 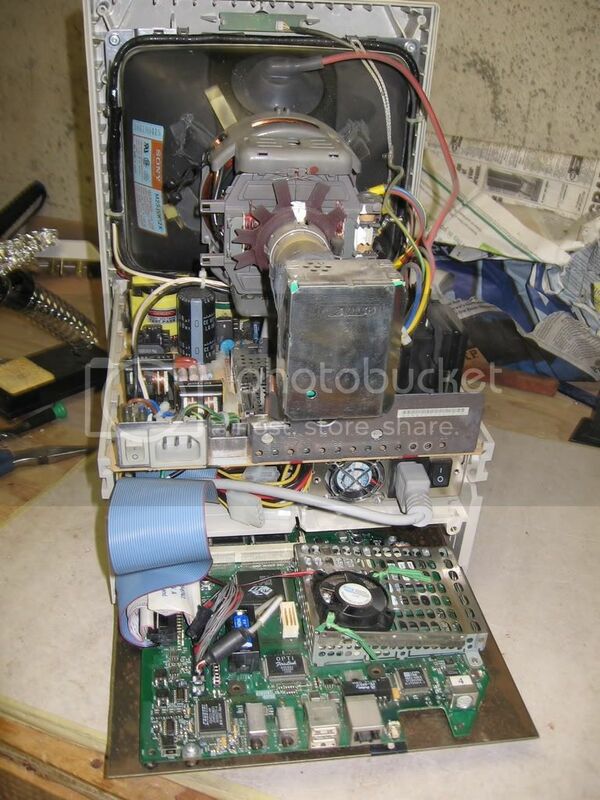 I ran into space issues when I added the power supply for the imac motherboard and wasn't able to add a floppy or CD drive internally. I recently added more memory to boost it up to 256MB but with a 233Mhz G3, it capabilities are far less than a mac mini. Right now I mainly use it as a music server for my workshop. Wow, that's really nice, Doogie! I think that's the first G3-in-CC mod I've seen that retains the original analog board. You've really got that packed in there without an inch to spare. When I did my Takky, I had the hard drive up above the analog board (no room for it with a dual-PCI riser on the 6360 board), but that gave me some RF interference grief. Nice that you were able to keep everything down below! I have to give credit to Brad Sturges as he came up with the idea and writeup. I also used Chris Lawsons writeup to do the VGA mod. 1) I modified and used the power filter card from the imac, even though there is proabably plenty of power filtering from the ATX power supply. 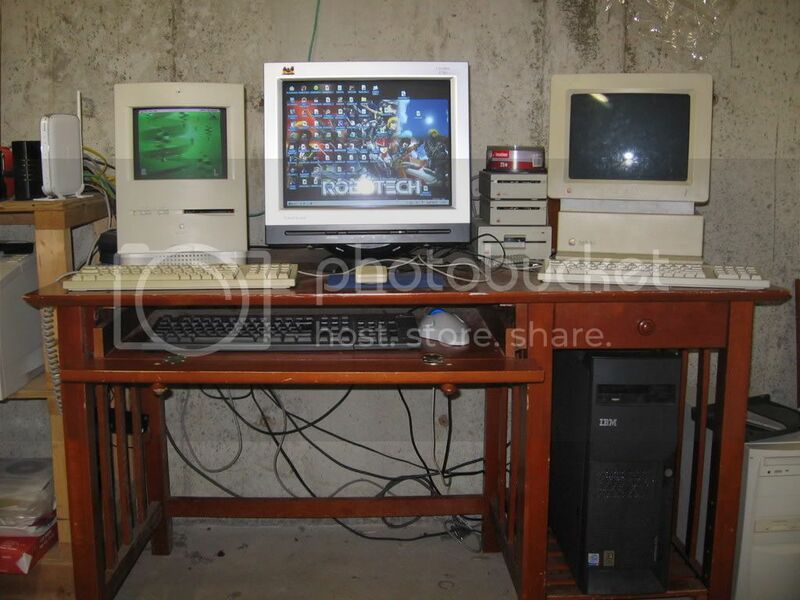 2) I did the ADB mod to the imac rev A motherboard so that I could use the original ADB mouse and keyboard. Now that I've some time again, I think I'm going to try to optimize space by either getting a smaller ATX power supply or remove unused power cables from the ATX power supply to get more room in the CC to mount a CD or floppy drive. How deep is that ATX supply? How deep is that ATX supply? Since it's shielded, that may be one component that would safe to move above the analog board without risk of RF problems. If you change the built-in fan arrangement on the rear case, the ATX supply may be able to sit above the analog board on the left-hand side (as viewed from the rear).